Stealth black carbon and world champion stripes come together on the Ritchey WCS Carbon Trail Rizer handlebar and WCS Trail stem we picked up at the company’s headquarters in San Carlos, Calif. recently. Before we mount them to a bike for testing, we thought we’d give you a First Look. 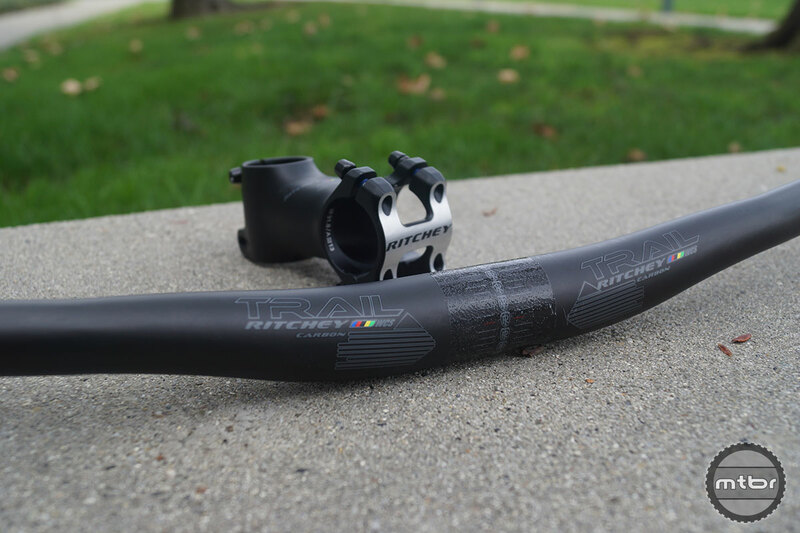 The $170 wide WCS Carbon Trail Rizer handlebar is 740mm wide, has a 31.8mm clamping diameter, 15mm rise, unidirectional carbon finish, and weighs 193 grams. The bars feature an anti-crush grommet (top, left) to prevent damaging the bar end by over tightening Lock-On-style grips. 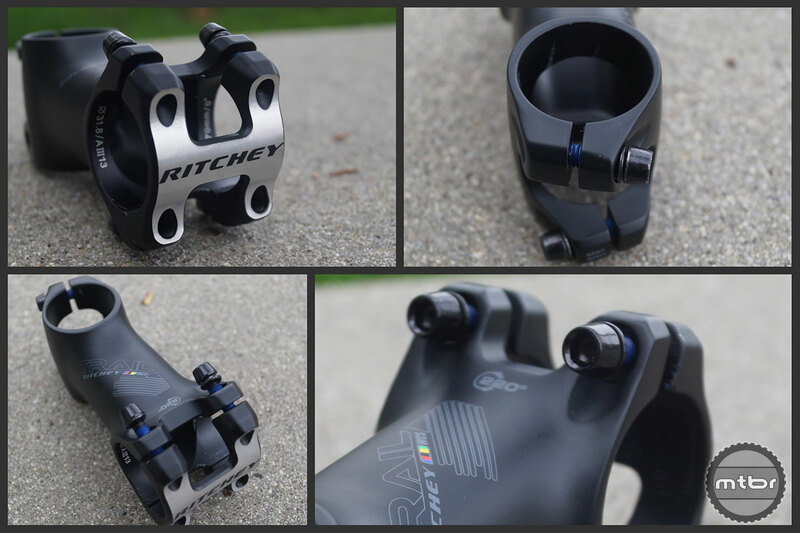 The $100 WCS Trail stem is specifically designed with longer-travel trail bikes in mind and features Ritchey’s unique rear-entry bolt configuration. It’s revised C260 clamp configuration is designed to clamp carbon bars precisely and firmly, providing slip-free performance and maximum lateral stiffness. The 3D forged alloy stem weighs 115 grams, fits 1-1/8-inch steerer tubes and features opposing-thread steerer clamp bolts. Ours measures 70mm in length but 45, 60, 80, 90, 100, and 110mm versions are also available. 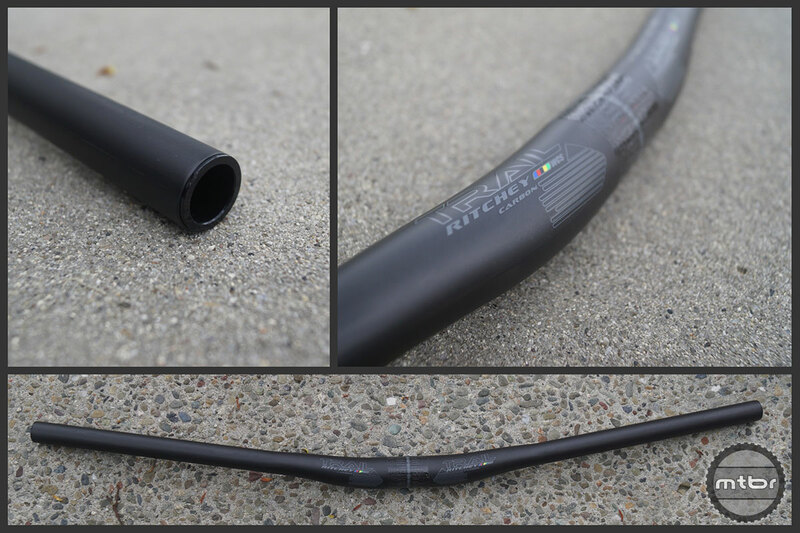 Look for a full review of the Ritchey Carbon Trail Rizer handlebar and WCS Trail stem on Mtbr in April. Good looking stem, but is that a lot of money for a stem these days? “Unique” refers to the gash or bruise on your knee after tagging that stem bolt. Seems like ergos can be strangely forgotten – similar to the remote on Thomson’s dropper. Ouch!